Hi loves! Today I am breaking up the nail art posts with some swatches of the newest Colors by Llarowe collection. It's called Krispy Kreme Dreams and the story behind it is quite funny. Here's what Leah Ann said about the set: "Krispy Kreme Dreams are what you get when you gorge on Krispy Kreme doughnuts before bedtime. I chronicled these dreams on my personal Facebook page in case you would like to hear the entire story. My friend Denise suggested that I also eat a banana with the doughnuts. I did and I must say that the second night's dreams were even better. I have always dreamed in vivid color and wake my husband up regularly laughing in my sleep. These colors are as crazy and vivid as my dreams." Isn't that hilarious?! And she's right, these colors are as vivid as they can be! Colors by Llarowe Amoebas Contain Tiny Spacemen is a bright, vivid blue linear holo with green and blue shimmer and green metallic flakes. The metallic green flakes add some extra interest and it has a bit of that lit from within glowing quality. I used 2 coats and topcoat. Colors by Llarowe Bananas and Krispy Kremes are Better Than HBO is a bright almost neon green/yellow holographic with yellow and green flame. I don't think I have anything like this in my stash! It dries semi-matte so topcoat is a must. Easy to apply, I used 2 coats and topcoat. 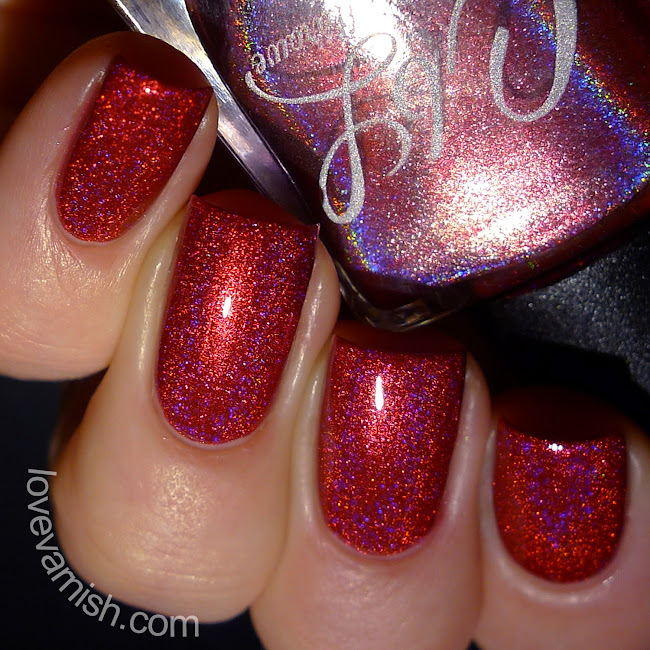 Colors by Llarowe Ben Affleck is Sheila's Homeboy is a super bright cheery red intense linear holo with red and slight blue flame. Such a stunner! There's this hint of magenta/pink to it that's impossible to capture but definitely there, and very opaque. I barely needed my 2 coats! Finished with topcoat. Colors by Llarowe Caviar Wishes and Keanu Reeves Dreams is a bright violet with slight red undertone holographic polish. The holographic finish isn't the strongest but the color is very creamy which to me makes up for it. It dried matte so topcoat is really needed to bring out a bit of sparkle. I used 2 coats and topcoat. Colors by Llarowe Giant Giraffes In My Yard is a bright, deep grape purple scattered holo with intense pink shimmer. Talk about a glowing beauty! The shimmer lights up the more jelly base and creates such a gorgeous warm finish. It's a bit more sheer so I used 3 coats and topcoat. Colors by Llarowe High School Was Rough Man is a turquoise shade with that gorgeous glowy holographic effect. This might be my favorite! It also builds up in 2 easy coats, I finished with topcoat. These shades are so colorful and happy, exactly what I need to kick out winter and welcome warmer days! My favorite is High School Was Rough Man but they all have their unique qualities. The formula was good on all of them but Ben Affleck is Sheila's Homeboy is the stand out in that department. I've also seen it being used to stamp! Are you as happy about brighter colors as I am? And which of these 6 shades is your favorite? Tell me in the comments! The Colors by Llarowe Krispy Kreme Dreams has released already and a restock is scheduled March 1st. For more information check the Colors by Llarowe Facebook page linked below!